In the late 19th and early 20th century there was renewed interest in the traditional songs of England. In a way, the new folk song enthusiasts continued the work of previous antiquarians who had collected music manuscripts from earlier times, and often they drew upon that work. The new antiquarians, however, had a significant difference: their material was in the memories and on the lips of living people. They were convinced that the traditional songs of England were disappearing, that their singers were aging and dying with a younger generation unaware and uncaring of the cultural treasures being lost. For this reason they did not collect manuscripts but created their own, visiting homes, pubs, travellers’ sites and workhouses in search of singers of generations-old traditional songs, writing them down as they were sung or, in a few cases, recording them on wax cylinders. To further these endeavours, the Folk Song Society was formed in 1898, bringing together the efforts of song collectors Sabine Baring-Gould, Lucy Broadwood and Frank Kidson. In 1903 they were joined by Cecil Sharp and Ralph Vaughan Williams. Great figures all, and all names well-known by enthusiasts of traditional music. Collectors of traditional folk songs, Rev. Sabine Baring-Gould, Lucy Broadwood and Cecil Sharp. Frank Sidgwick (1879-1939), who was active in the Folk Song Society from 1906, is not so well remembered now as his contemporaries, since he did not travel the highways and byways in search of songs. A publisher, writer, scholar and literary editor, he was an antiquarian in the old, pre-collecting-songs-in-the-field style, a collator and analyser of texts. With a researching interest in both early music and traditional or folk music, he is key to our story. (I argue in other articles for the significant overlap in style and material between early and traditional music: see here, here, here, here and here). In 1907 he edited the collection, Early English Lyrics: Amorous, Divine, Moral And Trivial with Sir Edmund Kerchever Chambers, an anthology of English song words before the advent of the sonnet during the 16th century; and between 1903 and 1912 he published Popular Ballads of the Olden Time in 4 series or volumes. It is in the Second Series: Ballads of Mystery and Miracle and Fyttes of Mirth, 1904, that we find the most significant available information about a traditional song that goes back to at least the late 16th century, and quite possibly earlier: The Lyke-Wake Dirge. The Lyke-Wake Dirge is a dark and mysterious song, with its references to “Fire and Fleet and Candle-light”, “Christ recieve thy Sawl”, “Whinny-moor”, “Brig o’ Dread”, and “Purgatory fire”. What does it all mean? And from where does that brooding melody come? Before turning to Frank Sidgwick and earlier witnesses for answers, let’s first decode the three words of the title. lyke: A late Middle English word (i.e. the English of the 12th to 15th centuries), from the Old English (i.e. English up to c. 1150) līc, meaning (dead) body, from which the ecclesiastical word lychgate is derived. wake: A vigil through the night over a dead body. The word is derived from two Old English words, wacan, to become awake, to arise, to be born, to originate, and wacian, to be or to remain awake. dirge: The word is derived originally from the Latin, dirige, meaning direct, an imperative of dirigere, to direct, from the antiphon which began the Catholic Matins service in the Office of the Dead, “Dirige, Domine, Deus meus, in conspectu tuo viam meam”, meaning “Direct, O Lord, my God, my way in thy sight”, from Psalm 5: 8. Dirige, in the context of the Office of the Dead, is attested from the early 13th century, reaching its contracted form of dirge from c. 1400, and the sense of any funeral song from c. 1500. Click picture to play video – opens in new window. The Lyke-Wake Dirge, arranged and performed on medieval harp by Ian Pittaway, using all the verses from John Aubrey’s ms. of 1686-7, with two verses from Cleveland Lyke-Wake Dirge added. The tune is that adapted in the oral tradition from Harold Boulton’s melody. The words and spelling below are as cited by Frank Sidgwick in his Popular Ballads of the Olden Time, Second Series: Ballads of Mystery and Miracle and Fyttes of Mirth, 1904. He explained, “The text is given verbatim et literatim from John Aubrey’s MS. of his Remains of Gentilisme & Judaisme (1686-7) in the Lansdowne MSS., No. 231, folio 114 recto and verso [i.e. front and back of the manuscript page]. This text has often been printed before, but always with errors. The spelling is Aubrey’s spelling. The present version was obtained by Aubrey in 1686 from an informant whose father had heard it sung sixty years previously”, dating the song to at least the 1620s. Clarifications are in square brackets. The second and fourth lines are repeated every verse. and Christ recieve thy Sawle. Disorganised polymath, John Aubrey, 1626–1697. (1) He was incapable of finishing anything he started. For example, today he is best remembered for his manuscript, Brief Lives, an idiosyncratic collection of short biographical sketches of the famed people of his day, never completed, its manuscripts now distributed among 5 institutions in 66 volumes. (2) He wasn’t always able to discern between the interesting and the verifiable, and tended towards credulousness. His Brief Lives account of William Shakespeare, for example, states that his “father was a Butcher, and I have been told heretofore by some of the neighbours, that when he was a boy he exercised his father’s Trade, but when he kill’d a Calfe he would doe it in a high style, and make a Speech.” William’s father, John, was not a butcher, but a glover and leather worker who also dealt in hides and wool, so not only is this boyhood story clearly false, but it has all the hallmarks of a fanciful tale about childhood fabricated retrospectively from knowing the man. (3) Aubrey’s insatiable appetite for learning led him not only to uncontained and disorganised industriousness but also to important discoveries. He was an archaeological pioneer, often the first to record monuments in the field in southern England, many of them megalithic, including the stone monuments of Avebury henge. John Aubrey’s Remaines of Gentilisme and Judaisme, a miscellany of customs, traditions, ceremonies, beliefs and traditional rhymes, was collected over a long period and written up between 1687 and 1689 but, like Brief Lives, never completed, and so remained a manuscript. It is now in the British Library as Lansdowne MS 231. While we must bear in mind the above caveats, this does not mean, of course, that the whole of Aubrey’s work is suspect. His work is the chief source for the song under discussion. Woman with a candle by Godfried Schalcken, 1643-1706. Frank Sidgwick, commenting on John Aubrey’s manuscript [square brackets are my own clarifications], wrote that “the Dirge … is prefixed [with] the remark, ‘This not ye first verse’” before the only first verse recorded. Sidgwick stated that in the first verse “Aubrey glosses “fleet” as ‘water’; but [James] Murray has shown (New English Dictionary [on Historical Principles, published in volumes from 1888]), by 93 quotations from wills dated between 1533 and 1570, that ‘fire and flet’ is an expression meaning simply ‘fire and house-room.’ ‘Flet,’ in short, is our modern ‘flat’ in an unspecialised and uncorrupted form.” In other words, the line indicates the setting of keeping the body at home before the funeral. The repeated refrain in the second and fourth lines, “eve[r]y night and awle”, “and Christ recieve thy Sawle”, seem to indicate that the events described in all verses happen every night since they happen to everyone on their death, and express the hope that the deceased has followed the right path in life in order to avoid punishment in the afterlife, as we will see. Here is that 16th century letter found by Joseph Ritson among the Cotton manuscripts. For ease of reading, I have updated the spelling and added commentary in square brackets. Whinnies, also known as furze or gorse, on a whinny-moor. The Whinnes shall prick thee to the bare beane. The image therefore presupposes that “Whinny-moor” has gorse spread all over the ground such that shoeless feet cannot in any way avoid pain. The burning of the shoes of the dead in order that they may wear them in the afterlife is a very old idea. Gods and performers of holy rituals in classical Greece would symbolically wear one sandal as a sign that they had one foot in the temporal world and one in eternity. This idea is present in a story by Greek philosopher, Lucian of Samosata (c. AD 125 – after AD 180). In his Philopseudes sive Incredulus – The Lover of Lies – is a tale in which Demainete, wife of Eucrates, returned from the afterlife for the golden sandal which mourners had lost and thus not burned, in order that, once found and burned, she could safely traverse the afterlife with both feet sandalled. This classical Greek story illustrates the longevity of the idea of necessary footwear in the afterlife. In The Lyke-Wake Dirge, spiritual footwear is a sign of morality, a life lived well in the service of others, rewarded by God in the hereafter. From the after-life’s “Whinny-moor” of prickly gorse to the “Brig o’ Dread” and “Purgatory fire”. 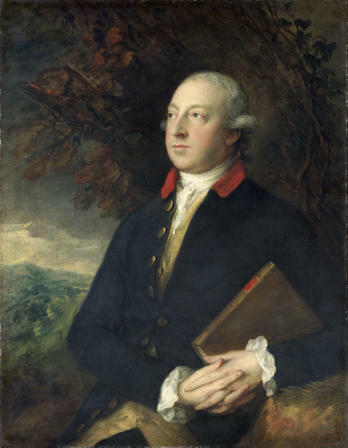 Thomas Pennant in 1776, painted by Thomas Gainsborough. The fire shall never make thee shrink. The Fire shall burn thee to the bare bane. 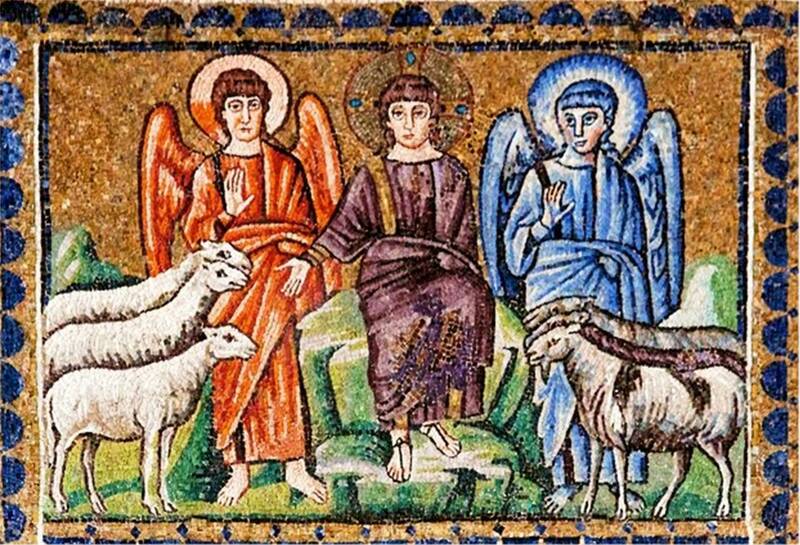 A rather literal depiction of the parable of the sheep and goats, from a 6th century mosaic in Sant’Apollinare Nuovo, Ravenna, Italy. An’ Christ tak up thy saul. So the ideas of “Whinny-moor”, “Brig o’ Dread” and “Purgatory fire” – or “Hell fleames” in the Cleveland version – are related and progressive. Just as the after-life’s “Whinny-moor” of prickly gorse will ‘prick your feet to the bone’ in a painful shoeless journey through the field as a method of passing judgement on an unkind life, the good are aided by their protective shoes because they gave to those in need; and it follows that the “Brig o’ Dread” is traversable only by those with shoes, who have shown love in tending to those in need; with the neglectful in life falling shoeless into the “Purgatory fire” or “Hell fleames”. We learn more of the proceedings surrounding “certain women [who] sing a song to the dead body”, as described in the mid to late 16th century letter signed “H. Tr.”, if we consult John Aubrey’s comments and sidenotes in his 1686 manuscript. For ease of reading, I have modernised Aubrey’s spelling and again added my own clarifications in square brackets. Aubrey’s own later additions to his work are in standard brackets. So, according to John Aubrey’s witness, Mr. Mawtese, the singer of The Lyke-Wake Dirge was a hired mourner paid to perform the singing ritual among the rest of the activities, or she was “like” a hired mourner, though in what sense is not made clear. The thought-world behind The Lyke-Wake Dirge gives us a rare insight into the vernacular Christianity of England, and specifically Yorkshire, in the 16th century. It is impossible to say how long it was that this tradition of imagery, and the song that carried it, had been previously active. That the everyday and familiar image of a furze field should be used as a symbol for judgement and the afterlife should not surprise us. After all, angels and saints in paintings always played contemporaneous musical instruments, usually in then-modern clothes and settings; and, even in the New Testament itself, Jesus called hell Gehenna, derived from the Hebrew ge-hinnom, canyon of Hinnom, a valley south-west of Jerusalem where human children had been burnt as sacrifices to the Ammonite god Molech, and where, in Jesus’ day, people used sulphur to burn their rubbish and offal. It must have been a vivid and powerful image to those for whom it had personal resonance. The holy presented as the vernacular: artists’ evolution of Saint Cecila, patron saint of music, always imagined in terms of the known and contemporary. Left to right: by the Master of the Saint Bartholomew altarpiece, 1505-10; Guido Reni, 1606; Simon Vouet, 1626; John Singleton Copley, 1803; unknown, Germany, 1912. I have made reference above to John Aubrey’s credulousness. I suspect that both “H. Tr.” in the Cotton MS, describing the “fondness” = foolishness of lyke-wake rituals, and John Aubrey, writing disapprovingly of “country vulgar funerals” and “the vulgar” people, both took what they heard rather too literally. I don’t suppose anyone in 1st century Jerusalem mistook Gehenna for actual hell, and I suspect the Yorkshire residents partaking in lyke-wake rituals didn’t think there was a literal furze field in the afterlife. Certainty is impossible, as the writers were not the partakers nor, probably, did these commentators ever meet the participants face to face. As for the religious beliefs behind the imagery, I don’t suppose, given the times, there was any real difference between “H. Tr.”, John Aubrey, and those “vulgar” people. Geoffrey Chaucer as depicted in Thomas Hoccleve’s Regiment of Princes, c. 1415-20. How far back in time do these lyke-wake activities go? Tantalisingly, Geoffrey Chaucer, in The Knight’s Tale of his Canterbury Tales, written at the end of the 14th century, mentions “how that lyke-wake was held all that night” (lines 2100–01). The scene is set in classical Greece, with “cups full of wine, and milk, and blood … with their spears clattering” and “funeral games”. Was Chaucer here writing only about the past, or was he conflating past and present, as Shakespeare so often did in his plays? Could Chaucer have been referring implicitly to the same kind of “country vulgar funerals” at which the mourners would “play at cards some drink & take tobacco”, with “mimical plays & sports”, as related by John Aubrey’s witness, Mr. Mawtese, referring back to the 1620s? It is certainly possible, more likely probable. According to Thomas Pennant, in his Tour in Scotland, MDCCLXIX , published in Chester in 1771, such lyke-wake activities date back to at least 150 years before Chaucer, as the Synod of Wigorn/Wygorn (Latin for Worcester, in England), 1240, declared disapprovingly that secular wakes, with dancing and games in the presence of the dead, were ugly and foolish. So it seems clear that the kind of lyke-wake that was the context for the song dates back to at least the 13th century, though we have no evidence to date the song itself to before the mid 16th century. In his Minstrelsy of the Scottish Border, Vol. II, Walter Scott wrote, “The tune is doleful and monotonous, and, joined to the mysterious import of the words, has a solemn effect.” Unfortunately, neither Walter Scott in 1802, who must have heard the tune, nor John Aubrey in 1686, nor Joseph Ritson’s letter writer, “H. Tr.”, in the 16th century, wrote the tune down; and Frank Sidgwick in 1904 didn’t mention it. The cover of The Young Tradition’s first LP, The Young Tradition. The song was revived for performance in 1966 on the self-titled debut LP of folk song trio, The Young Tradition (Peter Bellamy, Royston Wood and Heather Wood). Their melody is dorian (the tonic is the second note of a natural major scale) and hexatonic (having 6 rather than 7 notes in the scale, the 6th dorian note being absent). The same melody was also used for the song when recorded by The Pentangle on Basket of Light in 1969, then by Al Stewart in 1970 and then by several others in the years since, including Alasdair Roberts in 2005. The Young Tradition liner notes say that “there is no evidence of an air to the dirge in the tradition. The tune used here was given to us by Hans Fried, who heard it long ago from an old Scots lady, Peggy Richards.” It turns out this isn’t quite accurate. German poet, Erich Fried (1921–1988), moved to live in England in the 1930s, after which he had a son, Hans Fried (1944–), the giver of the tune to The Young Tradition. Hans worked in Collet’s Record Shop in London, which of course stocked folk LPs in the 1960s when the genre was riding a popular wave. On the YouTube page with The Young Tradition’s recording, Hans has given his own account: “I got this from my stepmother Nan (nee Spence) who heard it from an old Scots lady, Peggy Richards. The tune she sang was probably printed in Songs of the North by Robert [should be Harold – see below] Boulton in 1909 [should be 1895] and unconsciously changed by me into a more folk like tune. I taught it to The Young Tradition claiming no copyright. Subsequently sung by Pentangle etc.” The time when Scottish singer, Peggy Richards, sang The Lyke-Wake Dirge in the hearing of Hans’ stepmother and Hans heard it in turn from his stepmother is vague in The Young Tradition’s sleeve notes: “long ago”. Since Hans was only born in 1944 and The Young Tradition recorded it in 1966, it cannot really have been very long at all between Hans hearing it and The Young Tradition recording it. Other than her name, the identity of the Scottish singer remains a mystery, but the source of her melody is clear. There is no evidence of the song in Scotland, and the source of Peggy Richards’ tune was English rather than Scottish, despite appearances. A. C. MacLeod and Harold Boulton edited Songs of the North, gathered together from the Highlands and Lowlands of Scotland, published in 1895. The publishers were careful to distinguish between arranged traditional melodies and those that were newly composed: “Traditional Air arranged by”, “Old Highland Melody arranged by”, etc. covers most of the tunes as described in the book, which includes English composer Harold Boulton’s most well-known lyric, Skye Boat Song, set to an “Old Highland rowing measure”. The Lyke-Wake Dirge page states “Old North of England words. Music by Harold Boulton”, so we can be sure the song’s melody here is not traditional. The tune entered the oral tradition and its author’s name was forgotten. Though still recognisably the melody by Harold Boulton, it was significantly changed either by Peggy Richards, or by Hans Fried’s stepmother, Nan, or by Hans Fried, or by The Young Tradition, or cumulatively by all of them. The original melody, as conceived by Harold Boulton, was loosely mixolydian (the tonic is the fifth note of a natural major scale), becoming dorian in oral transmission by the time The Young Tradition recorded it. So I think we can say that, though the melody was not traditional in 1895, it was by 1966. The original traditional melody of the 16th century is lost, but the tune now used does fit Scott’s character description, “doleful”. I wonder if Harold Boulton had done his research and deliberately written it this way. A Lyke-Wake Dirge, “Music by Harold Boulton”, as it appears in Songs of the North, 1895. As with all pictures, click for larger view. In July 2017, out of the blue and as a result of this article, I was delighted to receive an email from James Hockey. James inherited some books from his late grandfather, amongst which is a small hand-made song book, one of only 250 printed in Kensington in 1929. The book has lyrics with illustrative engravings and the melodies printed in the back. It includes A Lyke-Wake Dirge and, intriguingly, the melody given is not one I have heard used for this song or for any other. It is certainly not a variant of Harold Boulton’s tune, published 34 years earlier. Is it unique to this book? The identity of the book’s originator is as much a mystery as the origin of the tune or the meaning of SB underneath the printer’s address. The illustrations are by Elisabeth Schale, the only name in the book, and all I can find of her is that she is listed as an artist in Arts & Crafts Exhibition Society: catalogue of the thirteenth exhibition, 1926 and Arts & Crafts Exhibition Society: catalogue of the fourteenth exhibition, 1927. If any reader has further information about this book or this melody, both James and I would be delighted to receive any news. The relevant pages from the book and the tune are given below. It’s quite a journey for a song: starting as part of a vernacular traditional ritual for the dead in the 16th century or possibly well before; including imagery that has much in common with the Bible, as we’d expect, but also with imagery found in Islam and in classical Greek mythology; its words recorded for posterity by witnesses who showed curiosity about the song but a lack of respect for the community who carried it; its music lost forever; with new music published in 1895 and a different melody now discovered in a mysterious book of 1929; revived on a 1960s folk LP through the chance hearing of it being sung to the newly composed melody; and now with a new life and momentum of its own through singers of traditional music, its original purpose all but forgotten. Tony, thank you. I had wondered if Hans Fried was still around, and it’s great to have his first-hand account. (He misremembers the printed tune as by Robert Boulton instead of Harold Boulton, as you see in the article.) Much appreciated. I’ll add his words into the body of the article. That’s an interesting question, Mary. I assume that Benjamin Britten’s tune is his own. I certainly can’t hear any musical connection with the Boulton melody and the arc of the notes sounds distinctively Britten to me. I’m happy to be corrected if anyone knows more. Hello, Jim, and thanks for your appreciation. I’m always happy to be corrected – we’re always learning – and your comment has turned my attention to something I hadn’t spotted, so thank you. I’ve done as you’ve suggested, and tryed playing it dorian on the harp (rather than keyboard), which sounds as I’m familar with it, and then phrygian, which sounds lovely (except for one odd little bit that needs an accidental) but different to how it’s usually sung and different to how Harold Boulton wrote it. So I’m still convinced that the melody as usually sung, starting with The Young Tradition, is dorian. The finalis is D, though it’s difficult to justify saying the reciting note is the dorian’s A. I can’t detect any of the typical intonation figures of either phrygian or dorian modes in this melody but, being a modern tune, I wouldn’t expect to, unless the author was trying really hard to recreate the medieval modal sound. But then I returned to Harold Boulton’s original melody, on which the traditional tune is based, and in that case you’re absolutely right: Boulton’s tune (which I hadn’t paid enough attention to) is not dorian. I don’t think it’s phrygian, either: that would have a finalis of putative E, presuming a natural scale, and a tenor or reciting note C. I can hear a little hint of one of the typical phrygian intonation figures, but overall, to my eyes and ears, Boulton’s melody is more like mixolydian, with a finalis of G, though it’s difficult to justify saying the reciting note is the mixolydian D and it doesn’t quite fit the mode. I don’t think we would necessarily expect the melody to fit a mode exactly: after all, even in the medieval modal heyday, non-ecclesiastical tunes were sometimes mixtures of modes or modally uncategorisable. I’m very grateful for your comment and have changed the article accordingly. If you’ve further thoughts, please do say.